Many historical collections in the University Archives & Historical Collections come from the Chamberlain Memorial Museum, which sent its holdings to Michigan State University in 1952. 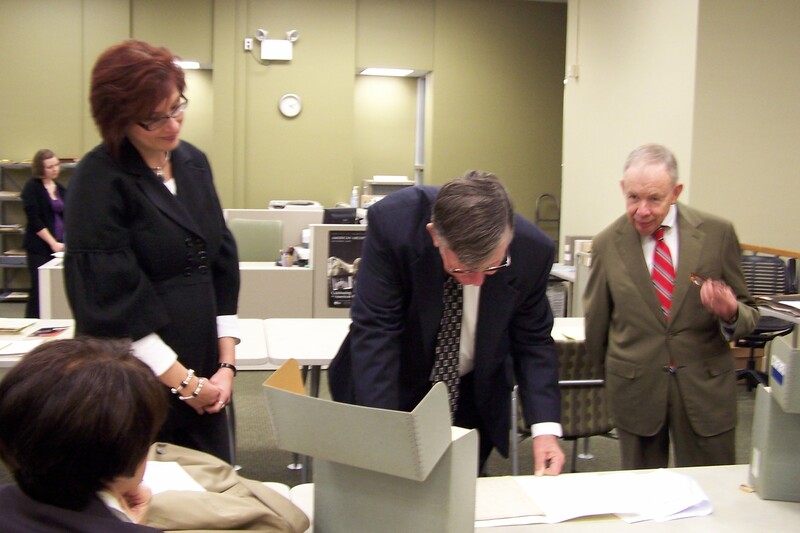 Descendants of Edward K. Warren, the museum’s founder visited the Michigan State University campus on November 19. The family toured the Special Collections Library and MSU Museum and went to a program at Cowles House, but ended their day in the University Archives reading the correspondence of their great-grandfather, Edward K. Warren, and great-great grandfather, Reverend Waters Warren. They also viewed family photo albums from trips to the Middle East. While sitting quietly in University Archives looking over family papers, Gus Whalen listened as his cousin, Bob, read from their great-grandfather’s journal. E. K. wrote about newly married couples in the community, messages for upcoming speeches, and his dreams. To share this kind of personal information about someone generations past was remarkable experience for all family members. Gus said he was overwhelmed and exceedingly grateful for everything. The Warren Family come from Three Oaks, Berrien County, Michigan. The collection of family papers consists primarily of correspondence, diaries, religious materials, and legal documents. Other materials in the collection consist of information about the World’s Sunday School Conventions which were attended by Edward K. Warren. Edward K. Warren founded the Chamberlain Memorial Museum in 1916 in Three Oaks, Michigan. The museum is named for his father-in-law, Henry Chamberlain. The museum was originally housed in Chamberlain’s home, but continued to grow due to the efforts of the E.K. Warren Foundation following Warren’s untimely death in 1919. The contents of the museum were transferred to Michigan State University in 1952 by Fred P. Warren, President of the Board of Trustees for the E.K. Warren Foundation. The trustees felt moving the collections to Michigan State would allow greater access to them by a greater number of people. An online exhibit about the Warren Featherbone Company was prepared by intern Leslie Beckman. For more information about the Warren Family papers, please contact the University Archives at archives@msu.edu. On Friday, August 21, 2009 the MSU Archives was visited by a family whose members have been students at the school dating back to the 1940s. Collin Meierbachtol recently earned his Master’s degree from MSU. He and his wife, Krista Cruse Meierbachtol, are current doctoral students at MSU. Collin’s grandfather, Dwight Herman, is a graduate of the MSU Class of 1950. Dwight came to MSU during World War II as an Air Force cadet and stayed at Abbot Hall. He returned to MSU after the war to finish his degree. During that time he and his wife lived in one of the trailers for the married students. While Dwight was in class, his wife was busy working at the campus police station. During their visit to the archives Collin and Dwight looked up Dwight in the student directories to get his student address. They were also able to find Dwight’s old student number. They looked at photographs of campus from the post World War II era when temporary housing was built to handle all of the students attending college on the G.I. bill. Are you a member of a family who have been MSU students for multiple generations? Let us know! We would love to hear your story. Contact archives@msu.edu. Collin Meierbachtol and his grandfather Dwight Herman visit the MSU Archives.